Nong Nooch Tropical Gardens Pattaya, Thailand (Photographs shot using a Nikon D5100 DSLR): Situated close to the city of Pattaya, two hours drive from Bangkok airport. 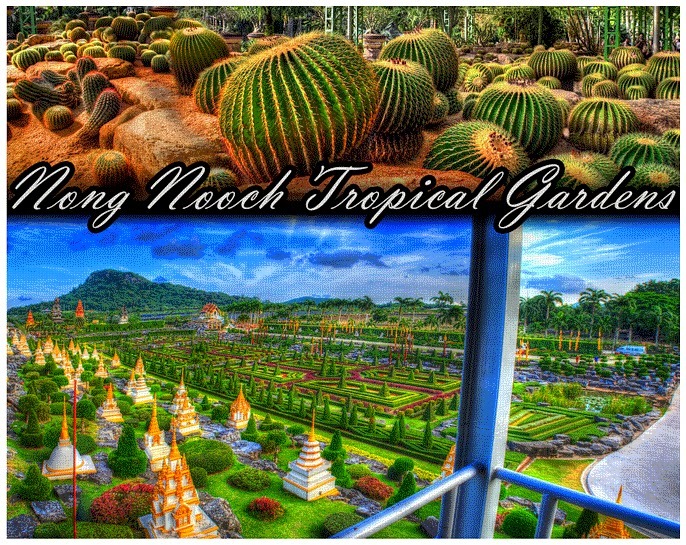 Nong Nooch Tropical Gardens offer both resort type facilities with complimentary park entry or a day trip admission fee of approximately Baht500. Getting there from Pattaya: Several hotel agents offer tickets and transfer packages that cost from Baht 800 to 1200 for a full or half day entry. I personally, ride from Pattaya, cross-country by motorcycle, which takes about two hours via (another local landmark) Buddha Mountain. And in doing so, escape the heavy traffic, while enjoying the scenic route landscapes. A bus will generally take you via Thanon Sukhumwit (Route 3) which is the busy main arterial highway between Bangkok and Trat. What to expect: The park and garden complex covers several square kilometers, with an ever-larger plant nursery and propagation facilities closed off to public access. These nursery areas include a large collection of Arecaceae; palm trees, cactus and lotus flower beds, among other tropical plants. The areas dedicated to the general public are well maintained, with sky-walks that meander between each theme garden and traditional entertainment shows presented four times daily. It can be hot: the average temperature for this area of Thailand is 26 - 29 °C. A large percentage of the gardens provide shade, nevertheless it is recommended that one carry ample water and sun protection. Photography: The following set of images have been processed using High Dynamic Range & Tone Mapping (HDR). A relatively new style of editing photographic images. For more information on this process please visit my post, "Creating High Dynamic Range". If you have any further questions please feel free to contact me via email.